Chocolate roulade. #Success, a photo by benparkuk on Flickr. It looks like a swiss roll, and tastes like a very light almost-melt-in-the-mouth sponge cake. I didn’t get the cream very even. Probably could have done with a bit more. And I ate some of it with a spoon before it even reached the roulade (sorry). 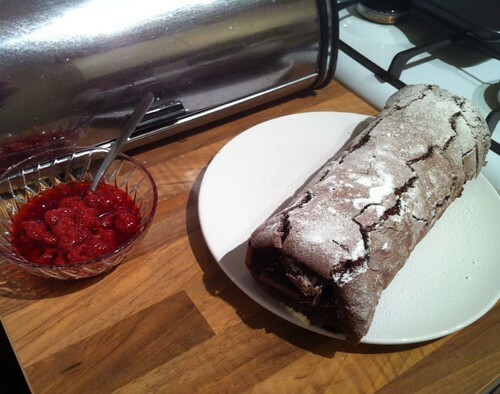 The recipe is one of Mary Berry’s, and is available on the BBC’s website: http://www.bbc.co.uk/food/recipes/chocolate_roulade_79152 – if you fancy making one. It’s quite an expensive dessert to make, especially if, in the case of this one, you use Green and Black’s fairtrade 70% cocoa chocolate, and Yeo Valley organic double cream. Was £6 just for those two ingredients. Still, tastes delicious, and it’s quite big. It’s designed to serve 8. Second warning: serves 8. And it probably does. It’s surprisingly filling for something made from mostly eggs and air. “One man’s (albeit slightly late) foray into cooking food more interesting than oven chips and beans on toast” – old strapline, 2007. This blog didn’t exist 4 years ago. What did though, was a food blog I started called “Mr Fussy’s Marmalade”. The basic premise is that I went through most of my teenage years not wanting to try new food. At some point in my mid 20’s, I had nothing else much going on in my life, so figured I’d try some of the foods I’d never eaten before while (sorta) learning to cook. It contained almost no pictures (which is a bit odd for a food blog, isn’t it?) ran for about 20 posts, then I got bored, and my mind wandered off onto other things (I’m still not a very good cook). I’ve finally got around to adding those posts to this blog though (I’m not selling this very well, am I? ), so if you fancy reading the sort of crap I was typing 4 years ago, then check out the new OLD category: Mr Fussy’s Marmalade. The oldest post in that category explains it better than I’ve just done above (and also why it’s called “Mr Fussy’s Marmalade”). This blog post by Graham Nunn about flawed logos by kitchen textile companies reminded me of a weird label I’d seen on something in a kitchenware shop, last year. Is Marisa Laurito a magician from the 1980s, who has branched out into cookware? The thing she has in her hand looks like a cross between a soldering iron (another area she could target, perhaps?) and a shrunken turkey baster. But this tag is on a sieve? I can see that to save money, you might have one picture that goes on all products. But in this case, wouldn’t you choose something like a whisk or a wooden spoon (or even a sieve! ), more instantly recognisable as something used in cooking? I mean what is that thing? An oven thermometer? A screwdriver? Should it have sparks shooting out the end of it, or is this a good moment to utilise that lifetime warranty? Even the angle she’s holding it at, is weird. And so close to her face, like a pipette in a school science class, that she’s about to squirt up her nose for fun. It doesn’t say cookware to me.